The Straight-billed Earthcreeper is sometimes included in the genus Ochetorhynchus, with U. certhioides and U. harterti, the Chaco and Bolivian Earthcreepers, especially for their different voices and nests, divergent from the members of the genus Upucerthia. The adult of nominate race has rufescent back and rump. The upperwing is slightly more rufescent, with more rufous at bases of flight feathers. The tail is mostly rufous with dark rufescent uppertail-coverts. 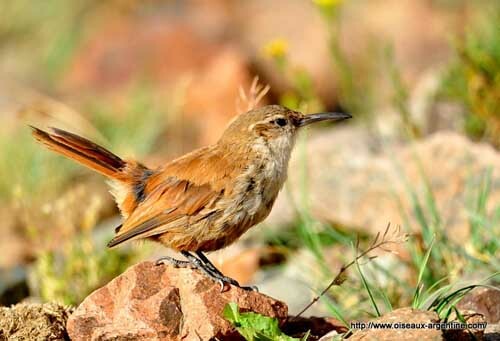 Central rectrices have rufous base and blackish tips, whereas outer rectrices are almost all rufous. 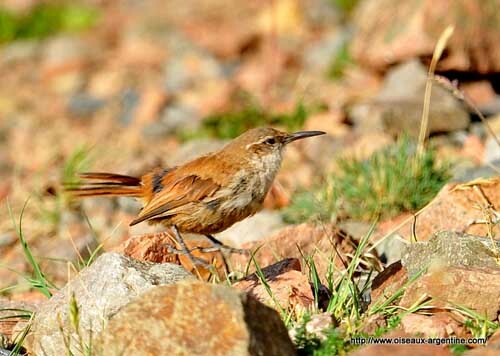 The other rectrices vary from blackish-brown to dark rufous. The tail is almost square. On the underparts, chin and throat are white. The breast is whitish with diffuse pale brownish streaking, most visible at sides. Belly and flanks are pale rufescent-brownish with whitish streaking. Undertail-coverts are tawny. On the head, the crown is brown. The face is dull brownish with some paler fine streaking. We can see a narrow white supercilium underlined by black eye-stripe. The long, slightly decurved bill (nearly straight) is blackish-brown or black, with pale horn-coloured base of lower mandible. The eyes are dark brown. Legs and feet are black to blackish-brown. 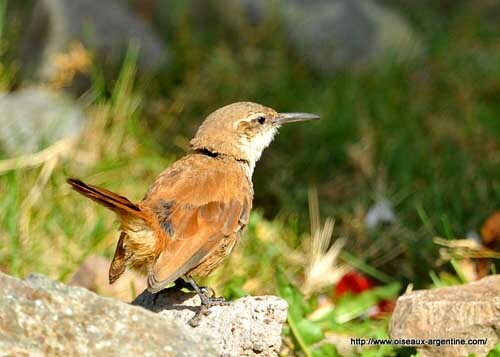 The juvenile is tinged rufous, with pale edges on crown and back feathers. There are three subspecies which differ in plumage colours. The southern races have darker and less reddish upperparts. U.r. montana is found in the Andes of S Peru, Bolivia, N Chile and N Argentina. This race has whiter throat and breast, darker belly, and conspicuous streaks on body sides and flanks. U.r. famatinae occurs in NW Argentina. This one has slightly darker back than nominate, darker flanks and undertail-coverts, and whiter breast. U.r. 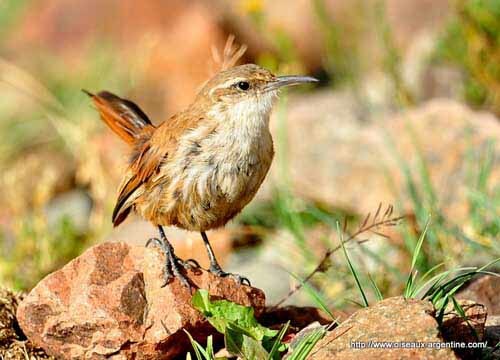 ruficaudus (here described) is found in the Andes of W Argentina and adjacent Chile. 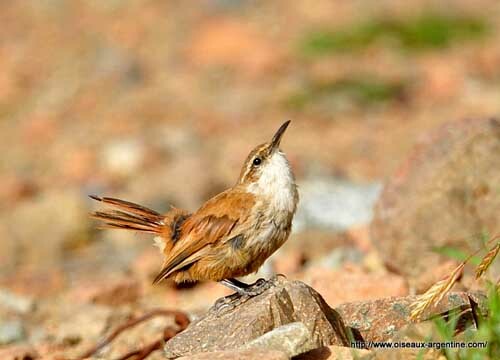 The Straight-billed Earthcreeper frequents the rocky slopes and the Andean ravines where it can be locally common. It occurs in arid montane scrub, between 2300 and 4300 metres of elevation, and locally down to 1300 metres. It is often seen near large boulders where some scattered bushes are present. The Straight-billed Earthcreeper’s call is a sharp “kweep” or “wheet”. The song is a loud, fast series of ringing notes rising at first and fading towards the end. It often sings from the ground. The Straight-billed Earthcreeper is usually seen alone or in pairs. This species is secretive. It runs and hops among rocks, but keeping out of sight. If threatened or disturbed, it runs to reach the cover and remains often hidden behind boulders. Its tail is usually held cocked high, or even slightly forwards above the rump. The Straight-billed Earthcreeper feeds on arthropods. It forages alone, gleaning food from the ground, searching between rocks or in crevices from where it extracts insects, including eggs and larvae. The courtship behaviour is poorly known. Pairs have probably lifelong pair-bonds, but this duration can be flexible. We can suggest that the cocked tail and the white feathers of chin and throat, play a role in displays, but more studies and observations are needed. This species appears to be monogamous. The Straight-billed Earthcreeper is resident in its range. It performs short, fast flights, usually low from the ground. The breeding season takes place during the austral summer. 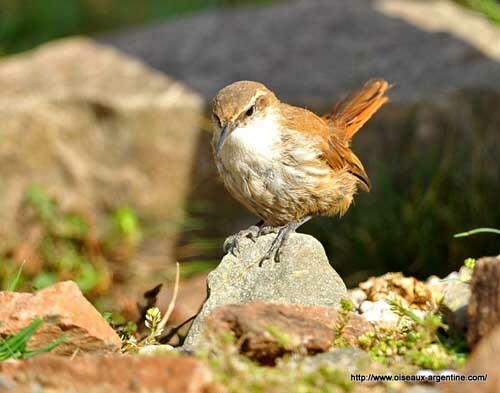 The nest is placed in natural cavity or short tunnel of 50-70 cm long, in bank or rocky crevice. The nest-chamber is lined with grass, hair and feathers. The female lays 2 whitish eggs. Both parents share the incubation during about 15 days. The chicks are fed by their parents, and fledge two weeks after hatching. The Straight-billed Earthcreeper appears fairly common throughout the range, but the main threat is overgrazing which involves degradation of the habitat. Populations appear fairly stable, but some declines are suspected. However, this species is not currently threatened.